What a second here, the Blue Lantern? I thought his lantern was green? what’s going on here? Wait, there’s a Red Lantern too? Next thing you’re going to tell me there’s a Rainbow Lantern, right? Sonuva.. 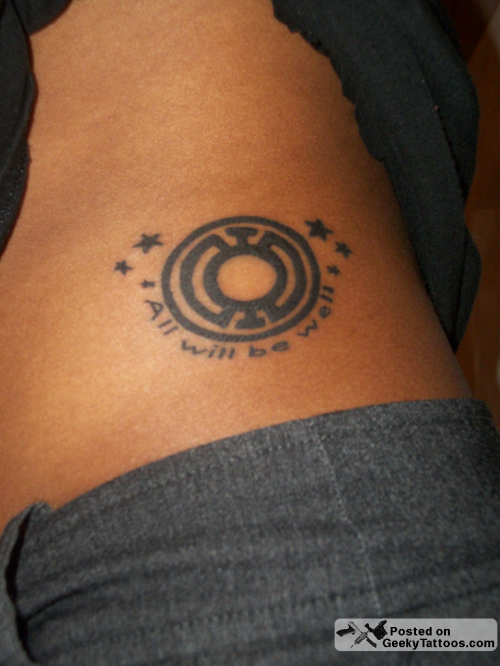 I got this tattoo done because ever since I started paying attention to the various Lantern Corps outside the Green Lantern, I was drawn towards the Blue Lanterns. This is probably because my boyfriend thought I was closely related to their guiding emotion: Hope. I hope for a lot, and I hope for things to go well. I get scared a lot and I just wanted my first tattoo to be something inspirational, that I can look at in the mirror and feel a little more confident for tomorrow. Tattoo done at the Blu Gorilla in Charleston, SC. Tagged with Blu Gorilla, Blue Lantern, DC, stomach. Unfortunately, the “handles” on the sides of the symbol should only be connected at the top, not the bottom.